Stockton started the game against a new Norton side with only 6 players available but proved far too strong for the visitors. Stockton played fantastic flowing football from the first minute and four quick fire goals from Kian put the Yellows well in control of the game. Some good exchanges between Archie and Kian was proving to hard to handle for Norton and with Owen scoring a brace before half time Stockton were on their way to recording the biggest win of the season so far. Oliver was providing great energy down the right hand side and Thomas was patrolling the defence and finding some excellent passes, Stockton looked like scoring every time they went forward and if it wasn’t for a fantastic performance by the Norton goalkeeper the score line could of been higher. 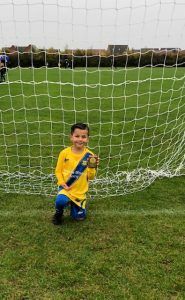 Another flurry of goals by Kian followed by strikes from Archie and Owen putt he game to bed, credit to a Norton side who kept going and got a goal their efforts deserved, the game ended 16-1 to the yellows with ten goals for Kian, two for Archie and four for Owen. Player of the match goes to Kian after a fantastic ten goal haul which had been coming after some brilliant performances in previous weeks.